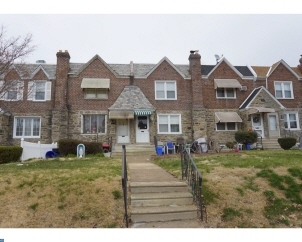 Description: West Mayfair 18 foot wide airlite row home. Front patio and steps enter into a large living room with parquet hardwood flooring throughout the living and dining rooms. Newly remodeled kitchen featuring tons of 42" oak cabinetry with pantry and ceramic tile flooring. Stainless sink, microwave oven and gas range. The 2nd floor features large master bedroom with parquet hardwood flooring and 2 closets. 3 piece ceramic tile hall bath with skylight and 2 other good sized bedrooms. The lower level of the home features a 15 x 15 basement with a converted garage into a work room. Laundry area and exit to rear driveway. This home has a newer kitchen, newer roof, newer windows, and newer hot water heater. Schedule your appointment today.